TABANOVCE, Macedonia - Dr Abdul Salam Sabbouh is a Syrian-born physician who studied medicine in then-Yugoslavia. Today, working with the Macedonian Red Cross in a field clinic provided by SOS Children’s Villages, he is on the front line in helping refugees at a transit center in Tabanovce, near the Serbian border. Dr Abdul moved to Yugoslavia in 1981 to study medicine and met his future wife in Macedonia. 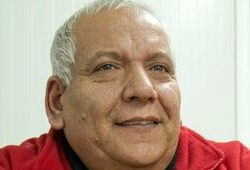 He worked in the western Syrian city of Homs from 1997 before returning to Skopje in 2010. His parents, seven siblings, and 12 nephews have been killed in the nearly five years since the Syrian civil war began. What are the most common health issues people have when they reach the transit center in Tabanovce? Most common are upper respiratory problems as the weather has turned cold. The weather causes influenza, headaches, tearing, throat problems, and problems with nose and with lungs. Children under ten years usually have problems with their lungs. When they have flu, they also need support for muscles as locomotor problems are common. All this is caused by the cold weather. The second group of problems are digestive. They are tired, the trip has been long and the immune system is weak; they are probably not used to the food they get. Who are the most vulnerable people arriving at the center? The most vulnerable are children and women - young men are stronger. I have seen that it’s not only physical weakness, but also psychological weakness that affects the health. All the fear, stress, worries [and] thinking about the money they have spent, makes their immune system vulnerable. Especially vulnerable are the children, of course. We are worried about children and about old people. We see diabetes and chronic illnesses. Malnutrition is not a big problem as the families have been in Turkey for some time, and there are aid organizations that distribute food, so we have not witnessed malnutrition cases. Fortunately, the parents are worried about the children. They come to us and seek advice and help if there is anything wrong, even if it’s a minor thing. You could see now a lot of children crying, but it’s because of the cold weather, not because of health issues. When the weather is warmer, the children are also more smiling and want to play. What are the most serious problems you have witnessed and what can you do about them? We have had few cases of epileptic attacks, diabetes type one and food toxication. Although people want to move on as quickly as possible, the ones who are ill still come and ask for help. The fact that we can transport people with special needs and pregnant women to the border, where our colleagues take them further, also helps. Otherwise they would have to walk four kilometers by foot to the Serbian border. The easier problems like flu, hypertension we treat here; we are able to give them first aid. In case of more serious problems, we transport people to hospital in Kumanovo or Skopje [Macedonia]. And it happens quite often. How is the cooperation with other NGO’s here in Tabanovce? The cooperation is good with all the organizations, but it’s especially good with SOS Children’s Villages, as we have the same duties. SOS takes care of children and mothers. We do the same as they are the most vulnerable ones. When we have sick children, we don’t want them to stay in the big halls. We are happy that we can send them to the Child Friendly Space run by SOS Children’s Villages. It’s a safe place for children and mothers. There they have food, it is warm and they can stay together with mothers. That’s the best cure. Does it help you in your work that you are originally from Syria? Of course it helps, it helps a lot in communication and to understand better the problems the ill person has. It also happens often that people need encouragement more than medical treatment. If the good words come in their own language, that’s even better. Will you return to Syria? If things get better in Syria, I want to visit my country again. At the moment it’s not possible. Everything in Syria is out of control right now.